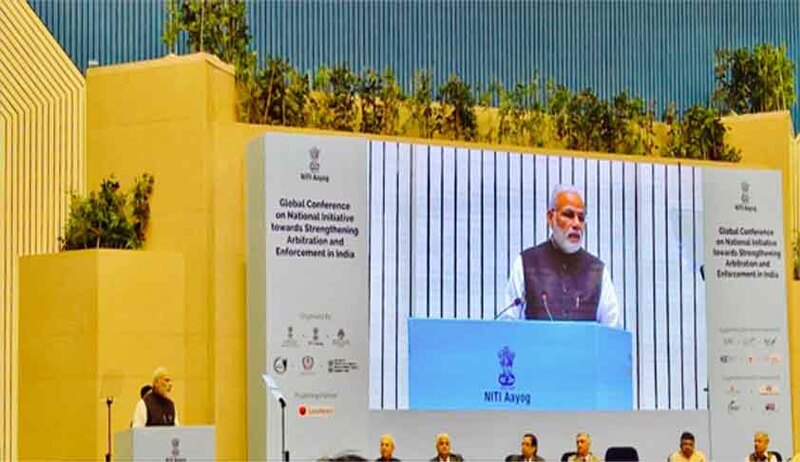 The three-day Global conference on National Initiative Towards Strengthening Arbitration and Enforcement in India came to a close on Sunday in New Delhi with the Prime Minister's address. Organised by the NITI Aayog, the conference was meant to identify the inherent lacunae in arbitration in India and to define a roadmap to strengthen the same. In the course of three days the conference through its sessions brought together numerous legislators, arbitrators, judges and investors in an engaging dialogue. The conference established that there is an imperative need to establish a fast track resolution of disputes and encourage arbitration in the country. The Union Minister for Law and Justice laid that apart from brick and mortar, what is needed is to ensure the quality and integrity of the legislators and arbitrators. Embracing arbitration in India and calling back the domestic arbitrations underway in other countries, Ravi Shankar Prasad said, "We have Make in India, work in India, now lets promote Resolve in India." The Prime Minister also on the occasion congratulated the NITI Aayog for organising the magnificent conference and hoped that the dialogue would not end with the conference and would go on between India and other countries. Encouraging arbitration in India, the Prime Minister said, "A vibrant ecosystem of alternate dispute resolution needs to be in place as India has become the biggest centre of FDI and the culture of start-ups has also increased manifold. In this case the corporates need to be assured that commercial disputes will be resolved efficiently and the rules of the game would not change overnight." Laying down the path of development of the ecosystem for arbitration the Prime Minister said that the availability of qualified arbitrators who conform to the proper code of conduct should be the first step. The Prime Minister also asked for a widened ambit of legal education in India. "We need arbitral institutions to educate in these matters. Mediation also needs to be encouraged as it's potential has not been tapped in India. This conference has provided the ideal platform to strengthen arbitration in India by implementing the suggestions received by various field experts. Let's make India a global hub for arbitration also," he said. Read the Full Text of the Valedictory speech by Prime Minister at National Initiative towards Strengthening Arbitration and Enforcement in India. Let me begin by congratulating NITI Aayog for organizing this global conference. India is today the fastest growing major economy, and one of the most attractive destinations for FDI. Indeed, we stand out as a bright spot in the global economy. This is the result of India’s fundamental strengths: democracy, demographic dividend and demand. We need to fully harness these strengths. This can happen only if businesses make long-term investments that create jobs and sustain economic growth. Our domestic market has been fragmented. Different taxes across different states have made goods and services more expensive. This has hampered growth in inter-state commerce. We are enacting a Goods and Services Tax law, to create an integrated national market. This will further boost domestic demand, create more opportunities for Indian business and drive job creation. India is experiencing a digital revolution. This is bridging the digital and economic divide in Indian society in general; and rural society in particular. A boost to the rural economy through this revolution will make the Indian economy even more robust. Innovative business models and app-based start-ups have instilled a spirit of enterprise among Indians. Yesterday’s job seekers are becoming today’s job creators. The legal profession is also opening up to the promises of the digital world. From cause-lists to case-laws, the lawyer’s library is now just a click away on your mobile phone. Businesses seek assurance of the prevalence of rule of law in the Indian market. They need to be assured that the rules of the game will not change overnight, in an arbitrary fashion. And that commercial disputes will be resolved efficiently. A robust legal framework backed by a vibrant arbitration culture is essential. Towards this end, we have initiated far-reaching legal reforms. Over a thousand archaic laws have been scrapped. We have enacted a comprehensive Insolvency and Bankruptcy Code, 2016, implemented the National Company Law Tribunals, established a statutory Monetary Policy Committee and effected a merger of the commodities and securities market. Further, in harmony with the Bankruptcy Code, we have amended the SARFAESI and DRT Acts this year to suit the changing credit landscape and augment ease of doing business. However, legal reforms can deliver desired results only when there is an effective and efficient dispute resolution mechanism. The independence of the judiciary is a basic feature of the Indian Constitution. Common citizens as well as businesses repose immense faith in the integrity of the judicial process. Our Government has taken various initiatives to improve the judicial infrastructure and administration. We have enacted the Commercial Courts, Commercial Division and Commercial Appellate Division of High Courts Act, 2015, for speedy resolution of commercial disputes. A National Judicial Data Grid has been set up to provide data on cases pending in district courts across the country. Steps are being taken under the e-Court Mission to computerize the entire court systems. Our Government has been working on a strategy for convergence of existing tribunals. This will help transform the existing complicated tribunal system into a simpler structure. We need to simultaneously facilitate a vibrant ecosystem for alternate dispute resolution, including arbitration, mediation and conciliation. This will provide additional comfort to investors and businesses. More importantly, it will also ease the case-load on Indian courts. Resolution of disputes through arbitration is not new to us. In ancient India, there were several mechanisms for settlement of disputes between the parties. These included the Kulani, or village council; Sreni, or corporation; and Puga, or assembly. Likewise, commercial matters were decided by Mahajans and Chambers. Today, corporates and financial institutions want legal experts who can help close business deals and transactions without any disputes and litigations. If a dispute arises, corporates want to resolve them quickly through arbitration, without going to courts. For this, they require specialized arbitration lawyers. Alternative dispute resolution processes also preserve personal and business relationships that might otherwise be damaged by the adversarial process. Recent trends indicate that Asian centres like Hong Kong and Singapore have emerged as preferred arbitration destinations. As popular business hubs, they also rank high in the levels of Ease of Doing Business. Thus, availability of quality arbitration mechanisms is an integral component of Ease of Doing Business, to which our Government is committed. Creation of a vibrant ecosystem for institutional arbitration, is one of the foremost priorities of our Government. Recently, major amendments have been made to the Arbitration and Conciliation Act. This has made the arbitration process easy, timely and hassle-free. Our law is based on the UNCITRAL model law. The objective is to ensure that in normal circumstances, arbitral tribunal makes its award within 12 months. In case of a fast track procedure, such award can be given in 6 months. Even the appointment of the arbitrator has to be decided by the Court within a period of 60 days. The impediments encountered earlier in the grant and process of award, have been removed. Further, as per the new law, any application challenging the award is to be disposed off by the Court within one year. The enforcement of award can be refused by the Courts only as per international practices. These amendments have brought our arbitration process in tune with global best practices. This has given us an opportunity to emerge as a leading arbitration jurisdiction. However, great opportunities pose great challenges. These challenges include: Availability of excellent quality and globally recognized arbitrators; Observance of professional conduct, ensuring neutrality, and timely completion of proceedings; and, Cost effective arbitration proceedings. India has no dearth of brilliant lawyers and judges. India also has a large number of retired judges, engineers, and scientists who can function as competent arbitrators in various fields. India’s economic interests shall be better served by a higher number of arbitration experts and lawyers. This in turn requires widening the ambit of legal education in India. There is need to develop specialized arbitration bar associations. We also need professionally run arbitral institutions which can deliver international standards of services at reasonable costs to businesses in India. We welcome internationally recognized institutions in this effort. We must deliberate on ways and means to supplement the efforts of the judiciary and arbitration mechanisms. Mediation is one such mechanism, the potential of which has not been utilized much in the country. An enabling alternate dispute resolution ecosystem is a national priority for India. We need to promote India globally as an arbitration hub. As Roscoe Pound famously remarked, “The law must be stable but it must not stand still.” We need to take inspiration from beyond our shores. This conference has provided the ideal platform to deliberate upon the crucial regulatory, policy and mindset reforms on this. I am sure, the deliberations here shall help in further strengthening Arbitration in India and set a milestone in positioning India as a global hub for arbitration amongst international practitioners, corporate houses and the legal fraternity. We look forward to effectively implementing your recommendations.